This event has been postponed due to weather. If you purchased tickets or tables they will be valid for the date of Feb 22. If you can’t attend the new date, please contact Sarah Arquitt at 360-419-3723 x2 or sarquitt@skagitclubs.org for a full refund. We apologize for any convenience. The safety of our staff and guests is our top priority. Come support Skagit County’s youth. 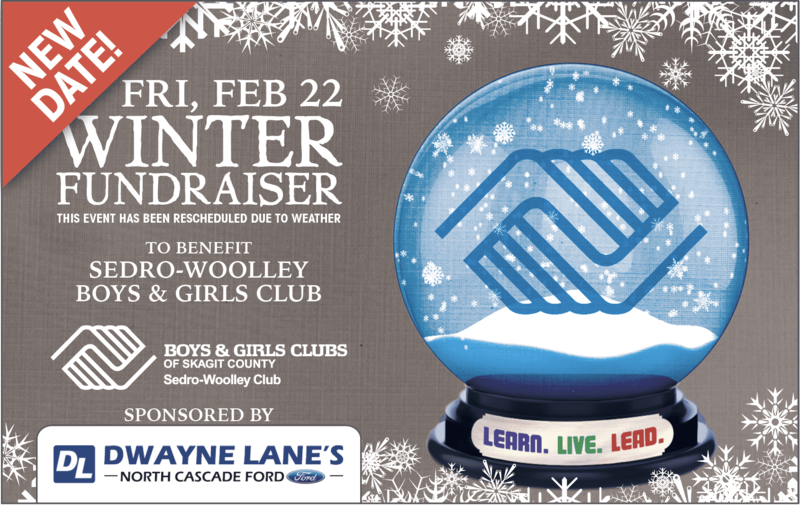 Proceeds will fund outcome-driven, Targeted Programs at the Sedro-Woolley Club. Select the Item above that you'd like to purchase. You will be added to the guest list. Actual tickets will not be mailed. You can add discounted tickets for youth 10 years and younger. Please list your guests or who you'd like to be seated with. I won’t be able to attend the Winter Fundraiser, but I’d like to donate. Enter dollar amount. Only hit Submit once. The form can take several seconds to process.